You’re driving the kids to school. The light turns green, and you cross the intersection. Suddenly, you’re hit at high speed directly in the side by a car that ran the red light. Your SUV rolls several times, and it comes to a rest with smashed windows and a crushed frame. The kids are terrified, you are feeling shocked and sore, and you have no idea who’s hurt and how badly. And it all happened on your normal morning commute just a few blocks from your home. You never know when a terrible accident can happen, and you have far less control over the likelihood of having an accident than you might think. You just can’t control other drivers. To make matters worse, after the above scenario, you find out that the driver who hit you didn’t have insurance. Now you have to take the person to court prove that the person was at fault for the accident, and then maybe again to get the person to actually pay what the court decided they owe. Mistakes in the service of process can derail or delay your case, so it is important that you work with a professional process server who won’t make these mistakes. An inexperienced person who tries to serve the documents can make mistakes like serving the documents to the wrong person, failing to put the documents right in the person’s hands, delivering the documents late, or failing to show proof of service. These and other mistakes can jeopardize your case. It’s important that you hire a reputable process serving company in Mesa with professionals with the skills and experience to avoid such mistakes. Making the right choice in process server can protect your case and the possible compensation you might receive for your injuries. You may be working on a timeline to start your legal case. There are sometimes time limits on when you can bring a case against someone for personal injury. But even if you aren’t working against a time limit, you likely want to get the compensation you need to pay for medical treatment as soon as possible. Hiring a process server can help you speed the process a bit. Process servers have the tools to find people quickly and to verify their identity. They then use tried-and-true strategies to serve those people quickly, before they realize that a legal case is pending against them and then take steps to avoid detection. A process server will help your lawyer find not only the defendant in the case, but also the other witnesses and experts needed to make a solid case at trial. A process server should be considered an essential part of your legal team. And, in case you are thinking about proceeding alone without a lawyer, make sure you consider the benefits of hiring a lawyer for a personal injury case. An attorney knows the fine points of the law that are relevant to the circumstances of your accident, and your attorney will use that knowledge to make a stronger case for you to receive compensation, as well as to maximize the amount of compensation you receive. Your attorney can also argue on your behalf, advocate for your interests, and help you negotiate the legal process. The insurance company representing the other driver will try many tactics to keep you from getting payment, including lying to you. An attorney will combat these efforts and help protect your rights. Your process server is part of the team that will help your attorney do that. 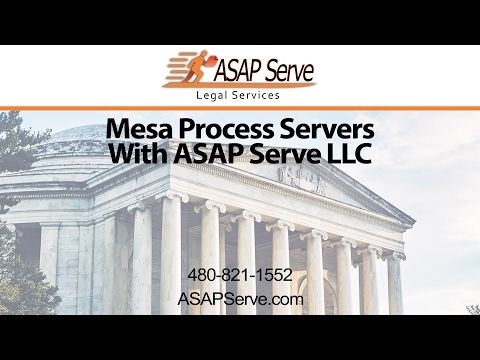 If you need a process server in Arizona, call ASAP Serve. We are a top-rated process serving company helping attorneys and individuals get the service of process they need for all types of cases. If you have been injured in an accident, it is important that you work with a personal injury lawyer. We’ll help your attorney get the service of process needed to get your case started on the right footing. Call us in Arizona today!